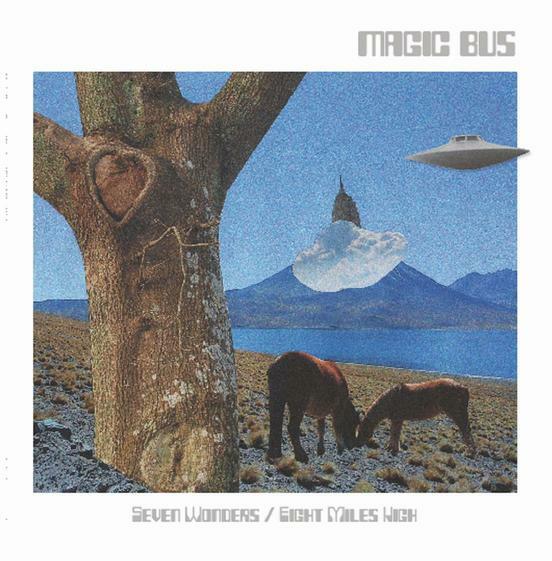 Devon’s long-haired weirdies, Magic Bus are more Caravan than Who, as evidenced by their latest, which pulls the A-side off their sophomore album (Transmission from Sogmore’s Garden) and weds it to a strangely familiar old warhorse. A sleepy-eyed nodder, ‘Seven Wonders’ also flashes floating Floydian finery with primo Genesis herbal encouragement, supplemented with flutes and a flittering frolic through an open field of poppies…poppies to make you sleep…. The unexpected highlight, however, may be the radical deconstruction of The Byrds’ chestnut, starting as an a capella somnambulist dirge before breaking out the harmonies, flutes, shuffling drums, and jazzy guitar licks that fades too soon. It opens up a whole new vibe that suggests the band could jam for another half hour before returning to the opening verse…or, you could just set up your phonograph player to repeat it three or four times. It certainly has me scrambling to pick up their albums.